PCOS Breakfast Recipes, Polycystic Ovary Syndrome Veg Indian Breakfast Recipes. Breakfast is the most important meal of the day and ensuring you have a healthy breakfast makes sure that you remain energetic throughout the day. Having a wholesome and nutrient-dense breakfast becomes even more important for women suffering from PCOS as skipping it can lead to hunger pangs during the rest of the day. You will end up eating more during the next meal, contributing to weight gain and aggravating PCOS symptoms. Including fibre-rich quinoa, barley and oats or protein-rich egg whites in your breakfast will keep you full for a long time and keep your blood sugar in check. see why oats is good for pcos breakfast. Oats are a great source of protein for Vegetarians. Whole Oats have an antioxidant called Avenanthramide (a polyphenol from oats) which helps lower blood pressure levels. Start your day with oats-based breakfast dishes like Oats Methi Multiflour Khakhra and Oats Upma. Use whole oats in apple steel cut oatmeal with almond milk or oats in oatmeal almond milk with oranges or my favourite is oatmeal almond milk with apples which you can carry to work and have as a healthy snack. see our healthy upma options for pcos breakfast. no sooji is used in the below recipes as there is no fibre in it. You need to have healthy grains in your diet for PCOS. You can have options from ragi upma, oats upma recipe and jowar upma. So yes, enjoy these upma recipes as they are good for diabetics, heart and weight loss also. Dosas, Idlis for Indian PCOS breakfast. yes, we have healthy dosa and idli recipes which don't use rice. Rice will cause a surge in blood sugar levels which is best avoided for PCOS. Eat healthy and choose from nachni dosa, wheat dosa and whole moong dosa. Again for making idlis, we have options without the usage of parboiled rice. try our sprouts and palak idli, oats idli and moong dal and spinach idli. Read which dosas and idlis are healthy as that will give you complete list of healthy Indian dosa and idli recipes. Or, indulge in tasty pancakes like Sprouts Pancakes and Zucchini and Carrot Pancake, which are made from antioxidant and fibre packed vegetables like carrot and zucchini. Discover many more such nutritious breakfasts in this section. Accompany these with fresh whole fruit for an added dose of antioxidants. 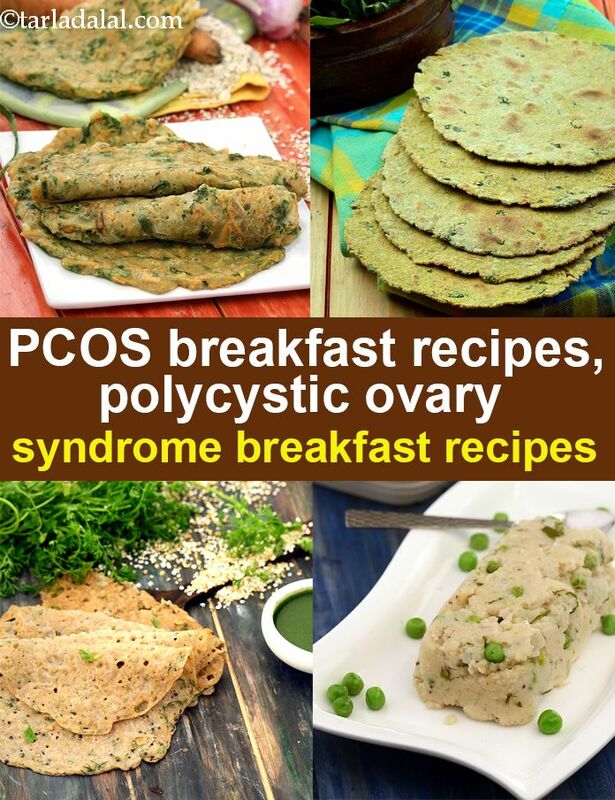 Enjoy our PCOS Breakfast Recipes, Polycystic Ovary Syndrome Veg Indian Breakfast Recipes and other PCOS articles below.